In true Canadian fashion, we’re profiling a local artist after all the Americans deem him worthy. Aaron Long is my kind of guy. Here’s why – he made this. On purpose. AND, in typical Canadian fashion, I just had to get the facts straight on this guy. So Dr. Long was kind enough to play along with our patented 8 Second Exposure! Dr. Aaron Alexander Long. The Dr. stands for Drumrollplease. 3) Whatcha doing for money? Working at my family’s music store. I’m not good enough at drawing yet to get a job in the industry. 4) Who is Fester and where did he come from? 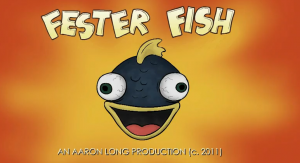 Fester Fish is your favourite cartoon character. He comes from watching too many 1930s cartoons in a row. 5) What was your medium and why did you choose it? I drew the animation directly into Flash with a Wacom tablet, mainly because it’s faster than having to scan a bunch of drawings into the computer, and the vector format makes it easier to export at different resolutions. The backgrounds were drawn in Flash but coloured in Photoshop. 6) Where can we see more of your stuff? I also have an old Deviantart account ( aalong64.deviantart.com ), but it hasn’t been updated lately because I got tired of struggling with their video uploader. 8 ) Do you go pantsless while animating pantsless characters? Always. I find it helps to crack the character’s personality. In fact, I’m still not wearing pants right now. Thanks for playing, Dr. Long! (I love that name.) If you, or anyone you know, is KO-ing other countries’ critics with their online animation cartoon film shows, drop us a line, and we’ll drop the patented 8 Second Exposure – on them. PS – pardon my absence recently, if you’ve noticed at all. I’ve been a tad busy. This entry was posted on Thursday, May 12th, 2011 at 9:57 am	and is filed under Profiles. You can follow any responses to this entry through the RSS 2.0 feed. I have a commercial gig that you’d be perfect for. Hit me up.